Aurora Sign Company: How Can Your Business Benefit From Monument Signs? In a sea of exterior sign options for your small business, how do you know which one is right for you? From illuminated signs to pylon signs and more, there are simply so many to choose from. One excellent sign option to consider is monument signs. Monument signs are typically characterized as exterior signs that are low to the ground with little-to-no space between the bottom edge of the sign and the ground. While this description may make them seem difficult to see, it’s just the opposite, actually. Monument signs are constructed from various materials such as wood, masonry, HDU foam, aluminum, metal, and other materials. Why Choose Monument Signs for My Business? Now that you have a general idea of what monument signs are, let’s explore the ways in which your company could benefit from these attractive exterior signs. If you’re interested in starting a sign project and want to talk to our team about monument signs, contact Sign Central, your trusted Aurora sign company! 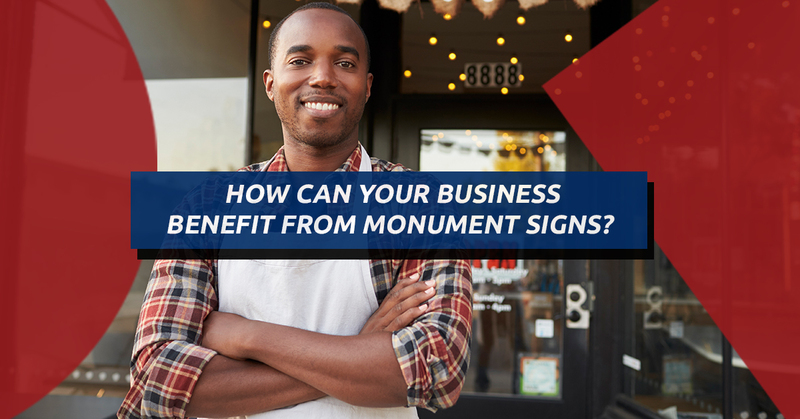 In the meantime, here are some ways your small business can benefit from monument signs. Monument signs can range from plain and simple to beautiful architectural pieces. The best part about monument signs is that they’re low to the ground, but quite large when compared to other types of signage. Why is this a positive characteristic, you ask? Simple! Because they are low to the ground, they provide a direct line of sight for people walking and driving by. Monument signs can be used for a wide range of businesses, including a single business, such as an accountant, or for a multi-business center like a shopping center. These exterior signs are customizable and can be cut into a variety of shapes, and customized with features like backlighting, illuminated channels, metal lettering, and make use of an eye-catching combination of a solid structure and vibrant graphics. They can even be outfitted with an LED readerboard for enhanced visibility and advertising. These signs are built to last and designed to withstand whatever Mother Nature throws at them. Because of the materials they’re constructed with, they’re one of the most weather-resistant exterior signs available, which also makes them one of the most cost-efficient signs on the market. Not to mention that they are easy to clean and care for. Best of all, they can be seen during the day or night, delivering 24-hour advertising and wayfinding. Start An Exterior Sign Project Today! Ready to drive more traffic to your business to help your company grow and thrive? Monument signs combine the beauty and aesthetic of architecture with the durability of an exterior sign, and the versatility of custom sign options, making them an ideal option for virtually any type of business, organization, or non-profit. When you’re ready to start an exterior sign project, don’t spend your precious time searching “sign companies near me” or “signage company near me,” when your Top Rated Local® Aurora sign company is just a call or click away!